>>> THIS THREAD IS ARCHIVED. The mirror site is very slow and can't bear a great load, so please try downloading several times from MTS2, before trying the mirror site. The links only work if clicked FROM THIS PAGE. The links can't be given to anyone and can't be posted to other sites. (plus almost all the objects from the Stuff Packs up to K&B). CEP Icon Set (by MaryLou): optional; it's mainly aimed to webmasters (to put them in the download web pages or in the local CEP Info page) and CEP enthusiasts. There are important info for creators and SimPE users in the "CEP-Extra_Documentation" file; read them if you want to be sure that the CEP EXTRA are recognized by SimPE. By now, the CEP is updated and supported by Numenor alone. But major credits go to RGILES and QUAXI for having invented and created with me the first CEP, that still "survives" into the current CEP. And last but not least, thank you very much to all the CEP users that helped me, reporting bugs, suggesting modifications and asking for more recolourable objects. Currently, I know of one problem only, with Apartment Life: some windows from OFB lose their recolors. Are there other problems with AL that I'm not aware of? I assume that you're already well aware of Phone Handset & Teddy Bear problem which started at IKEA pack. 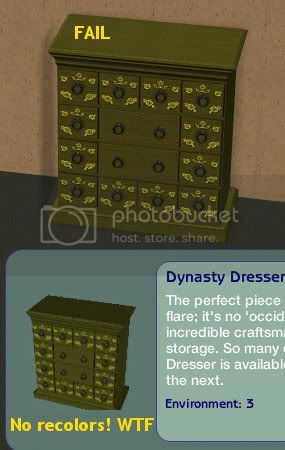 Dynasty Dresser from base game, as discussed in this MATY thread. I have a couple of requests like unrecolorable K&B deco objects or inclusion of Club Commercial Counter fix in CEP-Extra, but they definitely come as second to fixing AL borkiness. No, Queen of Snow means rhldavies as he answered her question. Yes, phone handset bug is pretty bad really. Can I try to remove CEPExtra for now until that will be updated? Also I cannot modify faces structure in the game anymore, I guess since IKEA. the dialog screen Vanity does not contain facial structure window. Try Shaklin unversal dresser - the plastic menu disappeared. Dresser: Thanks for the heads up! Phone handsets reverting to the base-game mesh: it has been fixed in CEP 8.1, and I tried today in my all-EP game, and they work fine (the right handset appear when I go to live mode). Doesn't it work for you? Or is there a different problem? Teddy bears: you are right, it seems that AL has broken (among several other things) my CEP Extra that made all the four bears recolourable and wornable. K&B objects: noted in my to-do list. Commercial counter: good find Included in the to-do. EDIT: I'm reading only now all the posts from mid July to late August, and I've found some other reports about the phones, though I can't replicate the problem. However I discovered some other interesting posts, that require my attantion (for example the trashcan not recolourable with lower graphic settings). Ailias - As for the phone handsets, read above. In any case removing the Extra should fix temporarily the problem (you will lose the recolours for the base-game phones). I don't understand the problem with the Vanity: do you really meand the face shape or the makeup? The face shape can only be modified with the special career object "Dr. Vu's Automated Cosmetic Surgeon", afaik. You did fix it for FT in CEP 8.1, but then IKEA broke it again, as you've mentioned in this thread. Probably it slipped from your mind, what with hectic real life and summer vacation. After all, this post is almost 3 months old. There are so many comments, so couldn't really find my way round 'em. Maybe this has been asked before... Has CEP anything to do with the loos of any other colors than red on the "ergo" windows from OFB?? I finally got recolors(any colors) to work on the toiletstall, but now they're missing in the windows. Is it just me with this prob?? The missing colours in the OFB windows is a known problem introduced by EAxis with AL; I'm including a fix in the CEP, but in the meantime you can use this fix by Fat D.
AL replaced some of neighborhood decoration objects, much to many people's chagrin. This issue is discussed here. I'm not sure if CEP can cover neighborhood decorations, just giving Numenor heads up. No, the CEP doesn't contain neighborhood objects; Havelock too mentioned that problem, but this bug will require a separate fix. Thank you anyway, and please keep on pointing out the possible glitches that AL has introduced, related to object recolours. I've had the game crash once but not sure why. Thinking it's unrelated to your cep. Thinking it was a bad apartment. I always learn the hard way, don't I? Hope you and yours are doing well. Thanks again for everything YOU ROCK!! Both the problem with phones handset changing to the base-game one, and the teddy bears issuing continuing errors are related to the new AL code; I've already updated both Extras and I will post the new CEP very soon. ....I will post the new CEP very soon. i cant wait! Thanks so much, Numenor, for your work on this. Also to everyone, such as Lord Darcy, that helped you find stuff that needed fixing. I'm so looking forward to the new CEP! #341 23rd Sep 2008 at 5:38 PM Last edited by MTS2Staff : 23rd Sep 2008 at 6:25 PM. Grata por Postar seu Trabalho. Grata por compartilhar se trabalho. Muito talentoso.